We have officially read every single one of Mo Willems' Elephant and Piggie books. We picked up the last three at the library on Tuesday, and C read all three of them that night. Can I tell you how much we love these books? C only has to read for 10 minutes each night, and after reading the first two books, he was up to 12 minutes. But he still insisted on reading the third one that first night we had them. With this series, Willems has captured everything an early reader book should be. Simple words and sentences. Lots of repetition. Clear illustrations with plenty of clues for an early reader, but not a lot of distractions. And most of all...the stories are fun! Funny, even. Enjoyable. They make my kindergartner want to turn the page. They make him laugh. They make him exclaim: "Watch what Piggie's going to do!" as he turns a page. They make him want to read. Today I Will Fly! This is the first book in the series. Piggie wants to fly but Gerald insists this is impossible. Piggie refuses to give up, saying "I will try." And try she does. My Friend is Sad: Gerald is very sad. Piggie keeps trying to cheer him up, but nothing seems to work. Why is Gerald so sad and what can Piggie do to make him happy? I Am Invited to a Party! Piggie gets an invitation to a party and asks Gerald to go along too. What will they wear? Not to worry. Gerald knows all about parties. There is a Bird on Your Head! Gerald is not happy when Piggie tells him that a bird has landed on his head. But soon, he realizes that one bird on his head wasn't too bad. This was the winner of the Theodor Seuss Geisel Medal in 2008. I Will Surprise My Friend! Gerald and Piggie decide to have fun and surprise each other. But it doesn't work out quite the way they expected. I Love My New Toy! Piggie has a new toy and offers to let Gerald play with it. But when Gerald accidentally breaks it, their friendship is tested. Are You Ready to Play Outside? Piggie is very excited to go outside. But when it starts raining, Gerald finds a way to cheer up his friend. This was the winner of the Theodor Seuss Geisel Medal in 2009. Watch Me Throw the Ball! Piggie wants to have fun throwing a ball, but Gerald insists that ball throwing is very serious business. Elephants Cannot Dance! Piggie tries to teach Gerald how to dance, but his moves aren't exactly on par with Piggie's. Pigs Make Me Sneeze! Gerald can't stop sneezing, and he's convinced that Piggie is the cause. Will he have to stay away from his best friend forever? I Am Going! 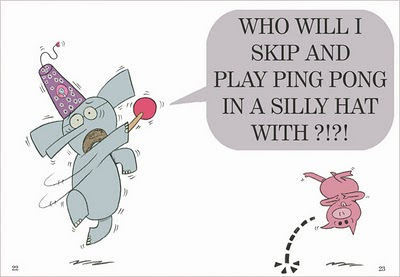 In the most recent Elephant and Piggie book, Piggie ruins a perfectly good day by saying she's going. Gerald is sad because he doesn't want his friend to go. But where is Piggie going? For more information about this series and Mo Willems, check out Pigeon Presents! and Mo Willems Doodles. There's even an Elephant and Piggie event kit available on Pigeon Presents! It has some great ideas in it. This review was written based on copies of the Elephant and Piggie books that I borrowed from the library. We have loved ALL of them as well!! I think I Am Going is one of my favorites out of all of them. Closely followed by I Will Surprise My Friend. The books are so well written and just FUNNY!! 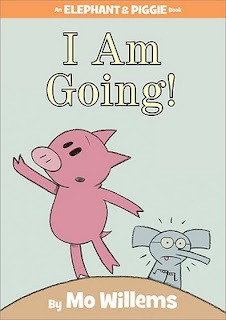 Mo Willems is so very talented. Glad you were able to make your way through them all finally :D We finished them up about 2 wks ago and finally got them all returned to WRL! LOL!! Someday these will not be checked out of the library. And if it's not soon when we get to studying Africa and elephants I am PUTTING IT ON HOLD!